A leading Tailoring and Alterations Service based in London. Having established themselves 1983 they specialise in Wedding Dress Alterations. Our team here at Identity Web Design have meticulously tailored together a responsive website to showcase this respected and reputable business alongside SEO to raise their google rankings to number 1 for various search terms. 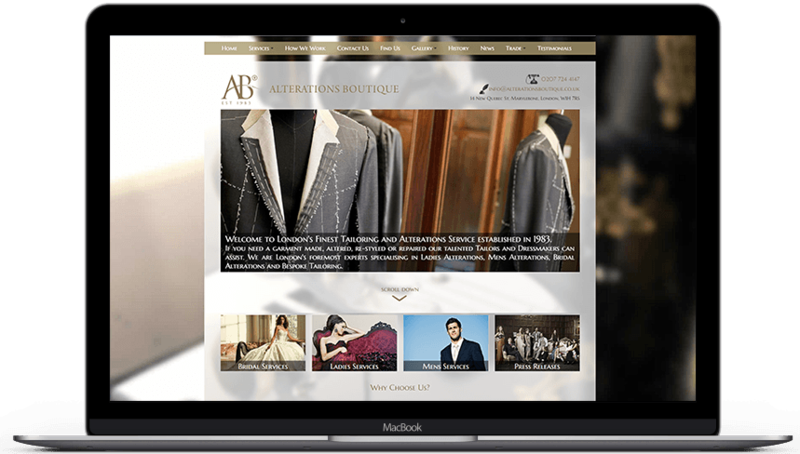 We stylised the functionality of the site to engage users and enable easier user experience. With a fixed sticky menu situated on the top navigation and fixed throughout site makes finding their way round the site a breeze. The visual aspect of the site includes eye capturing features such as Menu styling, slide show, widescreen, fixed background with a transparent body and hover over effect on images.